You have, I am sure, seen the Latin phrase carpe diem, which translates literally to “seize the day.” In modern usage, carpe diem is sometimes equated to “living in the moment,” taking pleasure in the here and now without regard for the future, and occasionally even an ode to hedonism. But the more important definition, in my opinion, is to take a chance, to go above and beyond what might be expected, to take full advantage of an opportunity, to stretch yourself in pursuit of the issue before you right now. This is a credo that I can embrace, and with the clarity of hindsight, I now recognize that it has been a recurring theme in the best examples of GIS projects I’ve had the good fortune to be involved with over the years. I’ll venture a guess that Latin scholars won’t like this, but I would like to offer a twist on carpe diem as it applies to those of us in the GIS profession: carpe geo, seize the GIS opportunity. I was honored to be the closing keynote speaker at the Utah Geographic Information Council conference in Park City this year, and I introduced carpe geo as part of my talk. It seemed to resonate well with the audience, well enough to embolden me to write this blog post to circulate it further. Consider for a moment how most GIS projects start. How many times have you been presented with a complete and clear set of requirements that translate directly to the GIS-based analytics you need to perform to reach a well-articulated outcome? My guess is that your answer is “never.” That would also be my honest answer, and I’m basing mine on more than 32 years in this field. Far more common, in my experience, is a very simple request like “Can you make me a map of…,” or “I hear you’re the mapping guy and my boss wants some maps for a report we’re producing,” or “Can you put my data on a Google map for me?” Sound familiar? I think these kinds of requests are partly due to a widespread lack of understanding on what GIS can actually do. How can a requestor ask for something that they know little or nothing about, except for possibly a vague reference to something they’ve seen somewhere? Vague or simple requests also represent an opportunity to explore, to teach, and to learn. The starting point is just that, and the trail from a vague request may lead to a very different destination than the one originally envisioned. That’s a very good thing, in the honorable tradition of scientific inquiry. This is where carpe geo comes in. As a GIS professional, you have accumulated a storehouse of prior projects, GIS methods, knowledge of data, professional contacts, and so on. You have some choices when you receive one of these simple requests. You can divert the request to someone else, you can comply in the most direct manner by providing literally what was requested, or you can treat the request as the start of a conversation and begin asking more questions. What problem are they really trying to solve? Is there something in the ensuing discussion that triggers an idea or a recollection of some prior work? Use the discussion to explore other ideas, suggest some things you might be able to try, and generally treat it as a teaching moment to help the requestor understand that you can do much more than they were previously aware. Then go and experiment, mine ideas you may have seen previously, “connect the dots,” see where the exploration leads. In short, get excited about the power of GIS available at your fingertips. Take the results and weave it into a compelling story line. I’ll offer one example, and it’s one that you may have seen before. Following the devastating flooding that occurred in New York City, especially in lower Manhattan, as a result of tropical storm Sandy in 2012, Governor Cuomo established the 2100 Commission to study infrastructure resilience and make forward-looking recommendations. I received a phone call from a staffer in the governor’s office asking if I could make some maps to support the commission’s work. A classic carpe geo opportunity. One idea led to another, and soon we decided to seek out historic maps to try to analyze shoreline changes that had occurred over time in lower Manhattan. What we discovered was amazing. The New York Public Library was able to identify scanned, geo-rectified maps in their collection going back 400 years. Stacking these maps up and analyzing the shoreline expansion told a very compelling story, especially when overlaid with the Sandy storm surge, which occurred primarily in the man-made shoreline areas. 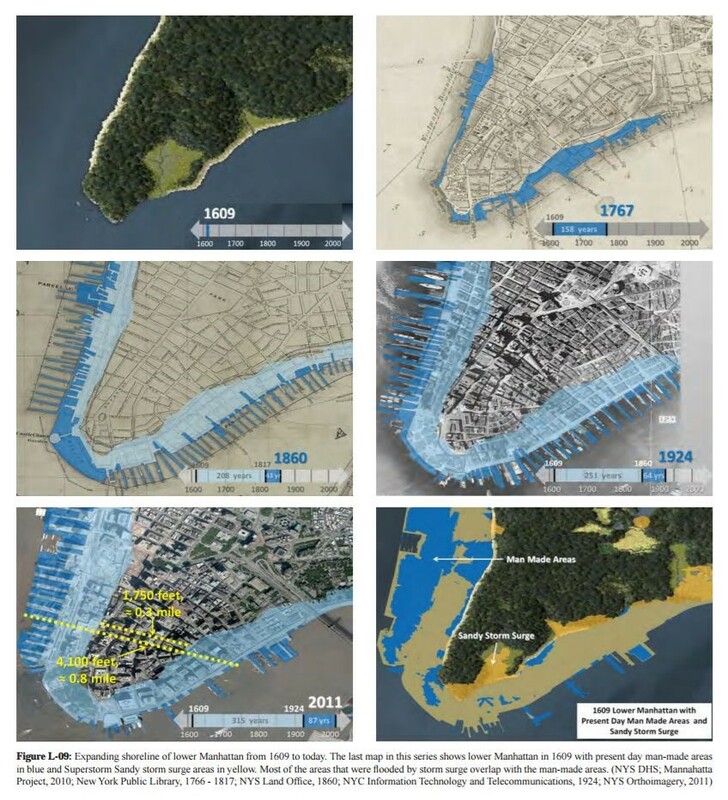 These maps made it clear that the flooding in lower Manhattan was largely a man-made problem. The image sequence below was published in the commission’s report. There are great stories out there waiting for you to uncover and share. It’s unlikely that anyone will ask you to do this. As GIS professionals, we are uniquely positioned at the crossroads of data, science, technology, policy, problem-solving, visualization, and story-telling. We abstract the world’s problems and their possible solutions into a form that others can more easily understand. If you aren’t the one who can pull the threads together, who is? The next time you hear a request that you might be tempted to dispense with so you can get back to your other priorities, embrace it in the spirit of carpe geo. Be like a hound that picks up the scent and follows the trail and my bet is that you will find both the journey and the reward very satisfying. I know that many of you have been doing this all along, instinctively, without giving it a second thought. Now you have a name for it, and not just any name, but one that sounds wonderfully scientific: carpe geo, my friends. Carpe geo.